The cyclical movement of Joëlle Morosoli’s kinetic installations questions the fleetingness of existence. In Caroline Cloutier’s photographs, the mirror taken out of its analytical role escapes our dimension. From July 10 to August 28, 2016, the Stewart Hall Art Gallery is proud to present the exhibition Suspended Time, in which Joëlle Morosoli and Caroline Cloutier use diametrically opposed techniques to serve analogous intentions and surprise the viewer between vertigo, lightness, and strangeness. Despite their apparent simplicity of form – minimal shapes, clean lines, technical mastery, alternation between fullness and void, play of light – the pieces brought together here confuse the visitor. Shadows shake; structures, deployed in a disturbing way, take on the look of sarcophagi. Mirrors multiply, but reflect only themselves in a place stripped of any connection to space and time. This tool, standing like a crystalline fortress, becomes an independent subject. Vertigo sets in, the cycle resumes, the instant is frozen in time. The pieces by Joëlle Morosoli and Caroline Cloutier exist beyond our humanity. The movements of the installations are unpredictable; the reflections of the blank fronts of the mirrors are disturbing. What happens in our absence? What do the mirrors in an empty room reflect? Does this mechanical pace continue endlessly? Does the exhibition survive after the visitor leaves? Here, art provides us with a framework for grasping an unknown world, outside our temporality. Visitors make the decision to enter the room, which means they are expecting to react. Seeking to uncover the secret of these works, they must first shake all feelings of otherness, so as not to be overcome by their inherent strangeness. With a Ph.D. from the Université Paris 8 in Aesthetics, Science and Art Technology, Joëlle Morosoli has over 40 solo exhibitions to her credit. 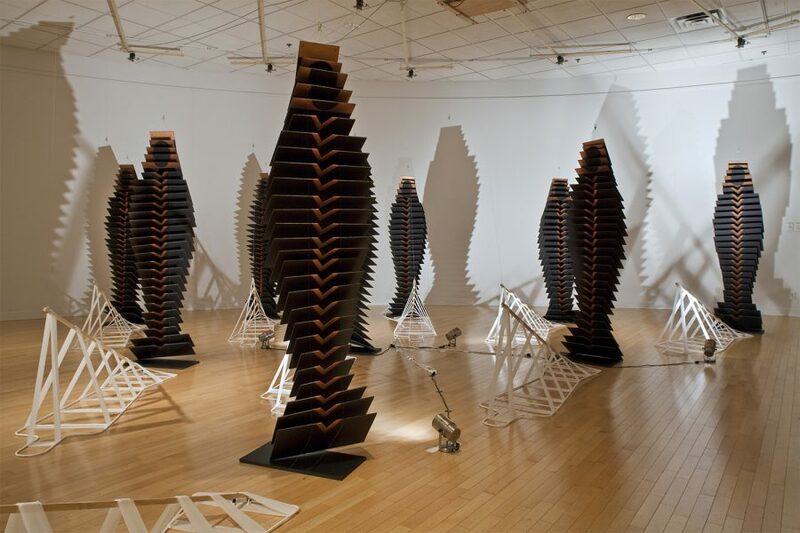 For over 20 years, she has been creating kinetic installations in which the activation of sculptures with electric motors alters the perception of space and of the piece itself. Morosoli has completed about 20 projects as part of the policy of incorporating art into architecture. A UQAM graduate with a Bachelor of Visual and Media Arts, Caroline Cloutier is currently focusing on photography and installation. Her pieces have been shown in Quebec and Toronto, in artist-run centres, symposiums and fairs. The research that led to the corpus Counter-Spaces, shown in the Suspended Time exhibition, began during a residency in Linz, Austria, in 2014. Artists whose works are exhibited in the Gallery are also present in public space. As part of the “1% policy, any public building project today must include an original work commissioned from a professional artist. This didactic exhibition explains the process. After visiting the exhibitions at the Art Gallery, kids are invited to build a paper structure that they can bring home or choose to add to an architectural construction on the walls of Stewart Hall.